October 15, 2013 – COTONOU, Benin – A contract has been signed between the International Fertilizer Development Center (IFDC) and the Embassy of the Kingdom of the Netherlands (EKN) in Benin for the implementation of a project that aims to increase food security and develop agricultural markets in Benin for the next four years (2014-2017). 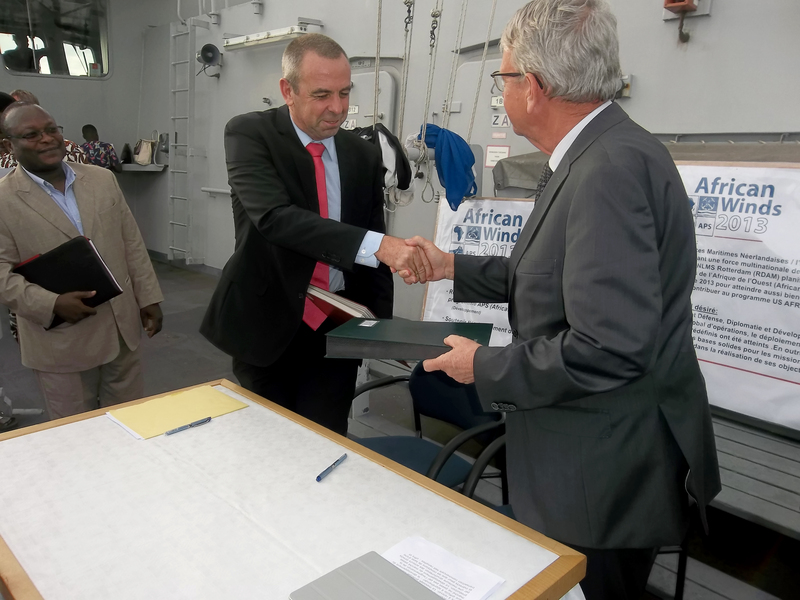 The ceremony took place on the Dutch marine vessel HNMLS Rotterdam, which was visiting Benin, in the presence of representatives of the Government of the Republic of Benin (GRB) and other development partners operating in the country. The new program will be implemented by a consortium of five members and led by IFDC. Other consortium members include the Royal Tropical Institute of the Netherlands, Care International Benin-Togo, Sahel Capital of Nigeria and Benin Consulting Group. “On behalf of the President and CEO of IFDC, Dr. Amit Roy, and on behalf of the other members of the consortium, I ensure that IFDC and its partners will make this program a success in Benin,’’ said Dr. André de Jager, director of IFDC’s North and West Africa Division, to His Excellency, the Ambassador of the Kingdom of the Netherlands in Benin, Jos Van Aggelen, prior to signing the contract. “It is a pleasure to continue working with the Embassy after successfully finalizing the implementation of the Improving the Access of Non-Cotton Agricultural Producers project [September 2009 – July 2013]. 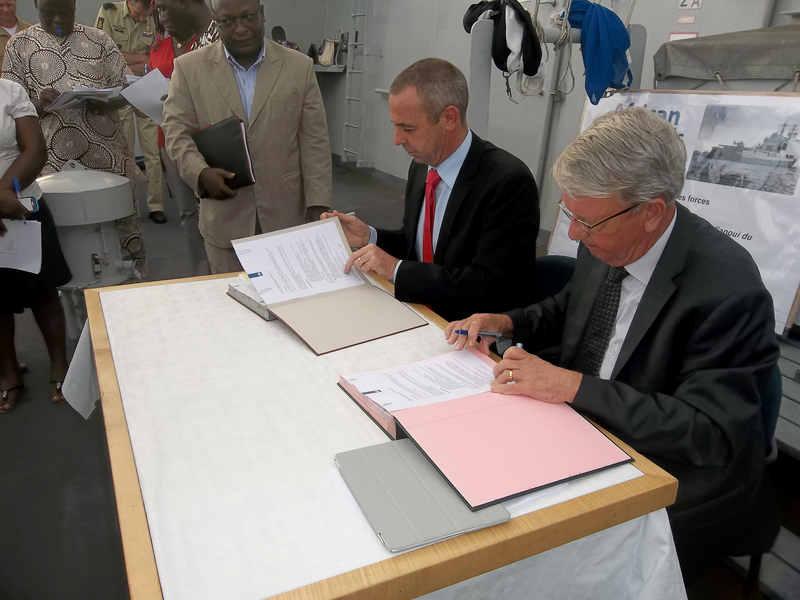 We are very grateful for this renewed trust in IFDC and its partners.” The contract-signing ceremony also provided a platform for de Jager to re-express gratitude to the Government of Benin for its support to IFDC activities and interventions in the country. The new program, Approche Communale pour l’Accès au Marché Agricole au Bénin (Communal Approach to Agricultural Market Access in Benin), is aimed at improving the livelihoods of 70,000 smallholder farmers and rural entrepreneurs through the development of agricultural business clusters in the Ouémé, Plateau and Zou Departments in Southern Benin by connecting them to agricultural market opportunities, including markets in Nigeria. “We are very excited to sign this contract with the IFDC-led consortium of organizations. They bring an excellent mixture of expertise, ranging from agricultural technology and development support to agricultural enterprises, knowledge about value chain development, support to link vulnerable groups to agricultural markets and knowledge of agricultural markets in Nigeria,” the Ambassador explained. 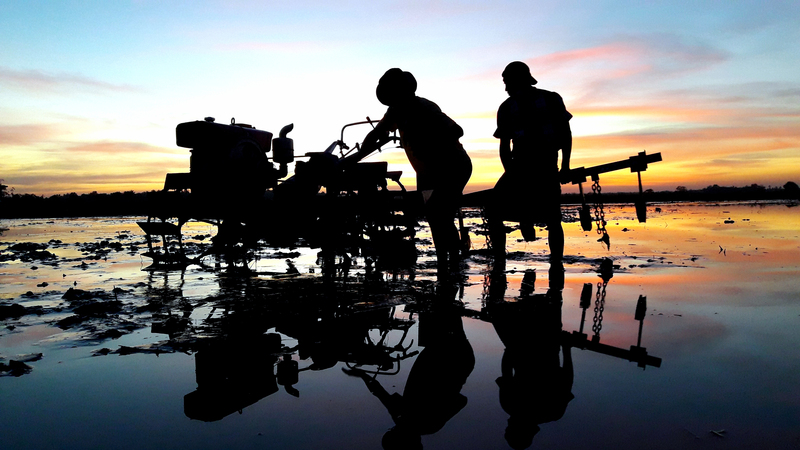 The grant of about 10 million Euros (US $13.5 million) will enable the consortium to efficiently back up the efforts of the government in revamping the development of the agricultural sector, particularly in the facilitation of access to markets through adequate infrastructure, adequate control mechanisms, identification of business opportunities and capacity building for stakeholders. Based in Muscle Shoals, Alabama, USA, IFDC is a public international organization, governed by an international board of directors with representation from developed and developing countries. The nonprofit Center, with over 700 employees in more than 35 countries in Africa and Eurasia, is supported by various bilateral and multilateral aid agencies, private foundations and national governments. IFDC focuses on increasing and sustaining food security and agricultural productivity in developing countries through the development and transfer of effective and environmentally sound crop nutrient technology and agribusiness expertise. Click on the links below to download photos of the contract-signing ceremony. IFDC North and West Africa Division Director Andre de Jager and His Excellency, the Ambassador of the Kingdom of the Netherlands in Benin, Jos Van Aggelen, sign a contract for the new Approche Communale pour l’Accès au Marché Agricole au Bénin (Communal Approach to Agricultural Market Access in Benin) program. IFDC North and West Africa Division Director Andre de Jager and His Excellency, the Ambassador of the Kingdom of the Netherlands in Benin, Jos Van Aggelen, shake hands after signing the contract.